All of us here at ERA are incredibly proud to announce that our own CTO and director of research and development, Sarah Sajedi, has been named a finalist for the RBC Canadian Women Entrepreneur Award for the TPH Sustainability Award. the TPH sustainability award is given to women entrepreneurs that have made a significant contribution to Canadian business & environmental sustainability. The award recognizes Sarah Sajedi's hard work and dedication in the development of ERA's environmental management software and her contributions to the overall sustainability of Canadian companies. It has been thanks to her vision and leadership that ERA has been able to thrive and become the industry standard of EMS software for the automotive industry over the last 17 years. The award ceremony will take place November 28, in Toronto. 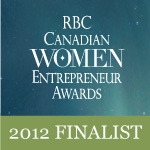 Over 3, 500 women were nominated for the RBC Canadian Women Entrepreneur Awards this year, and the awards will recognize a business leader for each category from Eastern, Central, and Western Canada. Women-led businesses are one of the fastest growing business sectors in Canada - women are creating jobs at twice the rate of the national average! The number of women with incorporated businesses has doubled over the last decade. Women entrepreneurs in Canada are creating more jobs collectively than the Canadian Top 100 companies combined. We all wish Sarah and all the other nominees the best of luck!